A Texas official is feeling big-time heat after comments he made about a county judge who spoke in Spanish during a news conference, KHOU-TV reported. 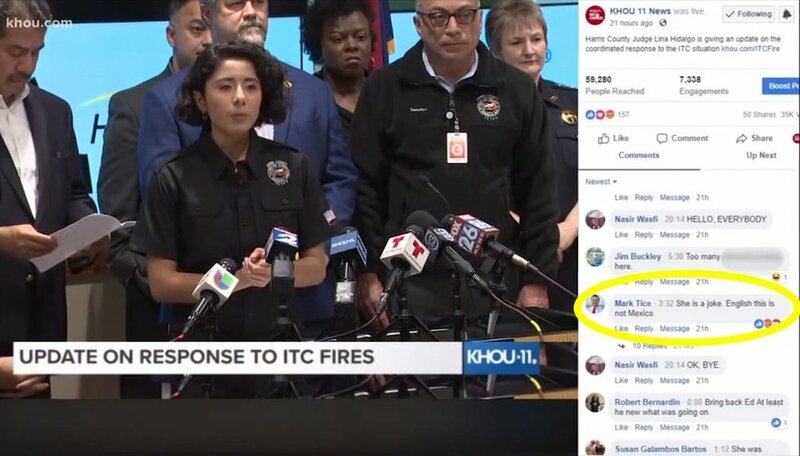 Harris County Judge Lina Hidalgo appeared on a KHOU livestream Monday to update the public on the ITC Deer Park fire — a chemical inferno that burned for more than 60 hours last week — and she spoke to the media in both Spanish and English, the station said. Chambers County Commissioner Mark Tice posted a comment to the livestream that read, "She is a joke. English this is not Mexico," KHOU said. The Houston Chronicle spoke to Tice on Tuesday, and the commissioner doubled down. "It's real simple," he told the paper during a phone interview. "This is the United States. Speak English." Tice — a Republican who was elected last year and is serving in public office for the first time — told the Chronicle he's not a racist and that many Hispanics in his precinct hold the same view when it comes to Spanish speakers in America. "This has nothing to do with race. If you come to this country, learn the language or get an interpreter," he told the paper, adding that if Hidalgo should also employ other widely used languages in the Houston area. "You got 300,000 Muslims [in the Houston area], so let's go ahead and speak some Arabic," Tice told the Chronicle. In regard to his reference to Hildago as a "joke," the commissioner told the paper it didn't have to do with her speaking Spanish but with her qualifications. "It's nothing personal," Tice told the Chronicle of the 28-year-old judge. "It's nothing against her. She's probably a great lady. The bottom line is, I don't think she's prepared to do the county's work." He wouldn't elaborate on why he believes Hildago is unqualified, the paper added. Hidalgo was born in Colombia and last year became the first Latina elected Harris County judge, the Chronicle reported, adding that other Houston public officials host bilingual news conferences, including Houston Police Chief Art Acevedo and Houston Fire Chief Sam Peña. After Tice's comments, Hidalgo's office issued a response. "As the Head of Emergency Management, Judge Hidalgo is directly responsible for the safety of all 4.5 million residents of Harris County, a third of whom are Spanish speakers," Kiran Khalid, the judge's director of communications, said in the statement, according to the Chronicle. "The vast majority of the public relies on local news for information in a time of crisis. Judge Hidalgo represents all of Harris County and given the county's composition and her bilingual skills, she will continue to communicate as broadly as possible especially when public safety is at stake." Chambers County Judge Jimmy Sylvia said in a statement that Tice's comments "are his and are not made on my behalf, or on behalf of the Court. I am currently in the process of reaching out to Judge Hidalgo and have left a message with her office," the paper added. Sylvia also said "Judge Hidalgo stepped up to the task and took care of her citizens. At the end of the day, that is what it's all about. Representing citizens as a whole — all of your citizens," the Chronicle noted. Antonio Arellano — communications director for Jolt, a nonprofit geared toward Texas Latinos — told the paper that Tice's comments are "reprehensible" and an attack on Latinos. "There is no need for a community leader to be disparaging or attack other communities because of language barriers or elected officials trying to overcome language barriers," Arellano also told the Chronicle, noting that for Tice "to think that Latinos would support [his] mentality is absolutely ridiculous." The Chronicle said that hours after its interview with Tice, he posted an apology on Facebook. The following is what Tice wrote, KHOU said. From my understanding, there were reporters asking questions in Spanish and Judge Hidalgo responded to those questions in Spanish, with no translation given. If that is not the case, then I sincerely apologize. Like many citizens concerned about the ITC fires, I was very emotional about the effect it was having on everyone. I apologize to Judge Hidalgo, the citizens of my County, and most importantly the entire Hispanic community for hastily acting out with transgression on social media. I recognize how my response could have been interpreted in a derogatory manner and for that I am sorry. I immediately regretted my choice of words. I'm not proud of my behavior, that is not the example I wish to lead by. I can only hope, in time, that my actions can be forgiven. Having grown up in Galena Park, Texas — a place that is and has always been a very diverse community — I was raised with the ideology that you do not judge anyone by their ethnicity, gender, or sexual orientation. Those values mean everything to me. It breaks my heart that I may have said anything that would lead anyone to believe otherwise. Those who know me well, know how deeply rooted I am within the Hispanic community. My sentiments on this issue were grounded in the passion and love that I have for the City of Houston and the surrounding areas. Again, I am truly sorry for creating this unnecessary situation.